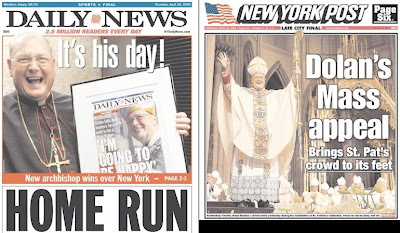 Whispers in the Loggia: "The People's Prelate"
And on this Morning After, here are the covers of Gotham's dueling tabloids... who usually can't agree on a damn thing. For the record, the "home run" sub-hed on the Daily News actually refers to the paper's coverage of tonight's Yankee home opener at the new, $1.3 billion successor to the House That Ruth Built (and Ratzi Blessed)... then again, given the rapt reception it received, the line could just as well sum up the reaction to that stemwinder of a homily. As previously noted, Tim Dolan makes his maiden appearance on Sirius XM Radio's The Catholic Channel at 1pm Eastern (1700GMT). For nonsubscribers who'd like to listen in, the satellite provider's free three-day trial is up and running as ever; the channel will likewise run the new archbishop's first 10.15 Mass in St Patrick's Cathedral on Sunday. "At Home" in New York: "The Happy Bishop"